This transit was observed by Captain James Cook during his first great voyage of discovery to the South Pacific from 1768 to 1771. He made his observations from Point Venus, near Papeete, Tahiti in French Polynesia. Other notable expeditions to observe this transit were those made by Pingré to Santo Domingo, by Chappe to Cabo San Lucas in Baja California and by Le Gentil to Pondicherry in India. Transit expeditions in the 18th century could be both frustrating and hazardous — Chappe died during a yellow fever epidemic at his observing site and the hapless Le Gentil failed to see the transit due to cloud. If he had gone to Manila, his first choice of observing site, he would have observed the transit! Venus crossed the disc of the Sun on 1769 June 3rd-4th. The map above shows the visibility of the event. The entire transit could have been seen from the northern and western parts of North America, north-west Mexico, the Pacific Ocean and northern and eastern Asia. The Sun set while the transit was in progress in the grey area encompassing the eastern parts of North America, Central and South America. The Sun rose while the transit was in progress in the grey area taking in Australasia, southern Asia, and parts of Scandinavia. The yellow lines on the diagram show the position of the terminator, where the Sun is either rising or setting, at the key phases of the transit. The geocentric circumstances of the transit are given in the diagram above. During the transit, the diameter of the Sun was 1890.7 arcseconds and that of Venus was 57.8 arcseconds. In other words, the diameter of Venus was 0.03 that of the Sun, making it look like a rapidly moving sunspot. The whole transit lasted just over six and a quarter hours. Local time in Tahiti is 10 hours behind Universal Time. In Tahiti, the transit began well after sunrise. Taking Papeete as an example, sunrise occurred at 16h22m (UT). The transit began with exterior ingress at 19h21m (UT) when the disc of Venus began to cross the limb of the Sun. Interior ingress occurred at 19h40m (UT), when the whole of the disc of Venus had crossed over the limb of the Sun. Venus then moved across the solar disc, reaching a minimum separation from the centre of the Sun of 623.5 arcseconds at 22h25m (UT). 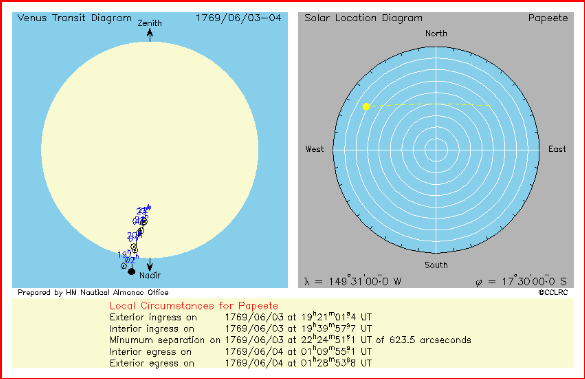 Interior egress occurred when Venus started to cross the solar limb for the second time at 01h10m (UT), and the transit ends with exterior egress at 01h29m (UT). Sunset occurred two hours later at 03h30m(UT). The progress of the transit is summarized in the diagram below. The left-hand panel shows the movement of the Venus across the solar disc. The top of the diagram points to the zenith, the point directly overhead. The position of Venus is marked every UT hour. The right hand panel shows the movement of the Sun in the sky. At the beginning of the transit, the Sun was north east at an altitude of 35°. By the end of the transit, the Sun was in the north west at an altitude of 24°.